Originally published here at ethnography.com in October 2011. In summer 2011, I had the pleasure of co-teaching a Sociology/English class for American students in Thailand. One of the real pleasures was using novels to illustrate sociological principles. It was kind of like profession (sociology) meets hobby (reading novels). I hope that the students liked it—I certainly did, and this blog is about what was my favorite Thai novel of the summer, Behind the Painting. It proved to be ideal for discussing a wide range of subjects stretching across both sociology and literature, particularly the meaning of duty and love in structuring Thai and American society. Behind the Painting by Siburapha is a classic Thai romance novel used to teach literature in Thai high schools. The first half of the book was published in 1937-1938 as a serial in the newspaper Prachachat, and the entire book later in 1938. The English translation by David Smyth was completed in 1995, and published by Silkworm books in 2000. The story drips with references to the Thai aristocracy; indeed, the lead female character in the story, as well as her husband, are always referred to by their aristocratic titles in Smyth’s translation. Set in the 1930s Japan, Behind the Painting is about a young Thai student Napporn and his relationship one summer with the newly-wed wife of a family friend. Napporn at the time the main story is set has been in Japan already for three years, seeking entrance to the upper class status that a foreign university education provides ambitious Thai. As with all well-born Thai, Napporn and his father consider such study abroad as a means to pull their impoverished country into modernity, and an entrance to the Thai ruling class. Still, Napporn’s father knew that there was risk to such a trip; in preparing Napporn for his long trip abroad—it will last eight years—so Napporn was betrothed to a woman chosen by his father, to preclude Napporn seeking out a Japanese wife. Completing the setting for the novel, are two visitors from Thailand who arrive in the summer of Napporn’s third year in Japan. They are a widower with the title Chao Khun Atikanbodi (roughly Lord University Dean), who Napporn knew previously in Thailand, and his new wife Mom Rachawong Kirati (roughly “Lady Kirati”). They are in Japan to spend the summer and become better acquainted following their marriage. At 22, the commoner Napporn is a youthful host for the 35 year old Kirati, and the 50 year old Khun Chao. Both Khun Chao and Mom Rachawong Karati are educated members of the Thai aristocracy, and are quickly swept into the swirl of social events in pre-World War II Japan. What this means for Chao Khun is activities among his peers at men’s clubs, embassies, and the world of Thai and Japanese elite. For his well-educated wife Mom Rachawong Kirati, it means pursuing her aristocratic passion for painting, and frequently being left in the company of the young student courtier, Napporn. The two of them share an enthusiasm for the world of art, literature, public parks, nature, and intellectual life. It is in this context that despite the differences in marital status and age, and even social status, the two find each other to be kindred spirits. In wide-ranging discussions, they explore the beauty of the Japanese country-side and architecture. More dangerously, the explore definitions of duty, loyalty, marriage, and love. In the process of these dialogues, a picture of the elegant Mom Rachawong Kirati’s life as the idealized woman of the Thai nobility emerges. This creates an increasingly personal dilemma for the now lovelorn Napporn who wrestles with the implications of being in love with a married woman, while he himself is engaged to his father’s choice. In contrast, Mom Ratchawong Kirati, the question about the ideal of the loyalty to duty and class, or one rooted in the longing for the union between love and marriage is never in doubt. Painfully for her the answer is clear: duty comes first. How Mom Rachawong Kirati and Napporn both reach this conclusion is the heart of the book, as the tension between romantic love, marriage, and duty to class and family is explored. In developing this point, there is actually much to be demonstrated for the western student who reflexively assumes that love and marriage are inextricably tied together, and trump broader loyalties to family and class. They do not, as Mom Ratchawong Kirati, and even Napporn, demonstrate with their own arranged marriages. Behind the Painting makes the point well that marriage is about duty, and preservation of society as much as love. Love comes first only for the most fortunate—and the most craven. But Mom Rachawong Kirati’s success as a “hydrangea in a vase” was bittersweet; her cultivated beauty attracted wide notice, but no eligible man stepped forward to ask her father for her hand. Thus, despite younger sisters finding husbands who both loved them, and met the approval of the families, she remained in her father’s household virtuous, lonely, and unloved. Finally, at age 34, her father suggests that she marry his good friend Khun Chao who was recently widowed, even though he was almost 50 years old. As she notes Khun Chao was a good man, but regretfully not one whom she can love; any hope that she can have anything but a dutiful but loveless marriage is sacrificed to the expedience he provides. So she dutifully enters into matrimony, and the two embark on the trip to Japan where she meets Napporn. Oddly the age difference between the 35 year old Kirati and 22 year old Napporn is similar to that between that of Kirati and her husband. Nevertheless, the relationship becomes very different. It is through the words of Napporn that we learn how he falls deeply in love with Mom Ratchawong Kirati, while knowing full-well that her duties are first to her husband, and his own to his family and his fiancé in Thailand. This is the context as the friendship between the two blossoms. She confesses to him that she is in a marriage that is unlikely to develop a true love due to the difference in age; she even confesses that Napporn is her best friend. And in the process Napporn becomes infatuated with her, and in a private space at the park at Mitake, he steals a passionate embrace and kiss from the older woman, while confessing his love to her. He pleads with her that she reciprocate his love, but she avoids the question. Mom Ratchawong Kirati, despite Napporn’s entreaties, refuses to confess that she too loves the forbidden Napporn and entreats him to look at her as an older sister. Kirati: That is your choice, of course; but in time, you will renounce that right, and you will do it of our own accord. Kirati: The very young have such faith in themselves; I congratulate you on that enviable faith, Napporn. Within days of her departure, Napporn writes Mom Rachawong Kirati two long love letters, which she receives after her return to Bangkok. In her response Mom Rachawong Kirati again protests that there relationship be that of an older sister and younger brother, a common and appropriate relationship in Thai society. And her protestations are successful—Napporn’s letters from Japan to Thailand become less frequent, and eventually are only sent at the rate of about three per year. Napporn’s love does indeed wane, as indeed Mom Ratchawong Kirati predicted. This slow-down even continues after the death Chao Khun two years later, an event that leads the widowed Mom Rachawong Kirati to withdraw from society, and become a recluse in an aristocratic Bangkok neighborhood. But to his surprise, and despite Napporn’s loss of interest, Mom Ratchawong Kirati is among the small group greeting Napporn at the quay upon his return from Japan at age 28, as indeed is his father, and a strange woman he doesn’t even recognize as his long-waiting fiancé. Thus, the relationship between Napporn and Mom Ratchawong Kirati is re-established as she wished as that between an older sister and younger brother; for Napporn at least, the infatuation of his youth died as indeed she predicted it would. His father’s arrangement for Napporn’s wedding proceeds, and Mom Ratchawong Kirati is invited; it is only at the last minute that she cannot attend due to ill-health. Mom Ratchawong Kirati’s story is a well-known in Thai literature, Thai film, and is required reading in schools. It is important because indeed, Thai society often wrestles with the tension between familial duty, and matters of the heart. In describing this tension, it is apparent that the conservative nature of Thai society is not simply the result of pseudo-Victorian sensibilities that the Thai aristocracy brought back from Europe (or Japan). An alternative interpretation is that such literature is also about the virtue found in denial of self, and duty to a broader social honor. Notably such themes are central to the doctrines of Theravada Buddhism which then, as now, permeate Thai society. Siburapha (1938/2000). 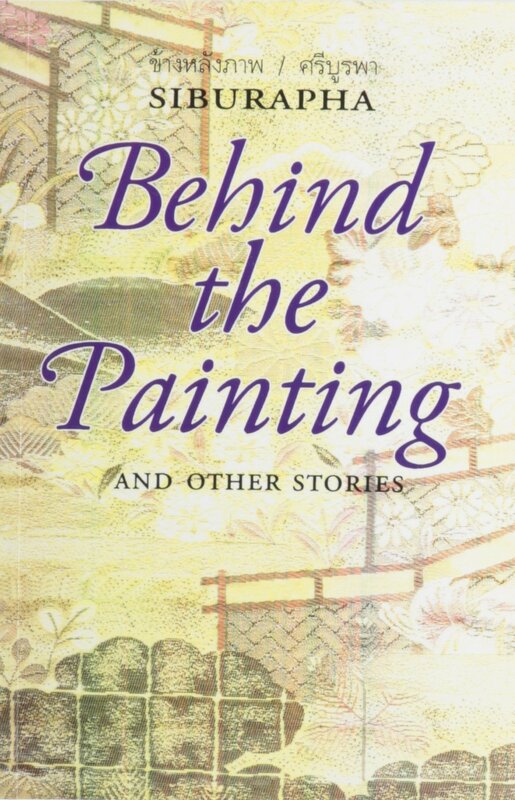 Behind the Painting, and Other Stories, translated from the Thai and introduced by David Smyth. Silkworm Books: Chiangmai. Thanks for the story. It actually enlighten my reading desire. As I found it very interesting. It made me to imagine the pleasure it was teaching this novel. To me, the mere use of the word classic is an understatement. As the narrative seems very captivating. It leaves me to ask how can one get a copy of this class “A” novel? By reading the intro I am made to desire the whole. One phrase I never will forget is the one that reads “Though I died with no one to love me, still my heart is full for I die loving someone.” Indeed it pains to love and can’t be loved. But whatever the case is, that’s the maize of life and we must all learn to live by the rules. Thanks and hope you can help me get a copy of “BEHIND THE PAINTING”. Thanks for the comment, and I’m glad you enjoyed the review. It is a very thoughtful book about love, social inequality, and Thailand, and (obviously) I highly recommend it. Well thanks, I will check it up on Amazon. I am currently based in China. It was a nice piece you prepared. I actually woke up to it this morning. And I think it was a great start for my reading this morning. So thanks for the great job.